Just as in the aftermath of 9/11, the San Bernardino mass killings and the biased media frenzy that followed, have provided the stimulus used by the enemies of peace to mobilize their aggressive hate speech attacks against Muslims. Violence against women, children, and houses of worship are daily occurrences and no one or nothing is exempt. The facts stemming from San Bernardino have raised questions and concerns to observers within and outside the American Muslim community. Social media is buzzing with questions that need answers and coincidences too orchestrated to be believed. Did secretly “radicalized” or “ISIS inspired” Muslims perpetrate this terrorist attack, or do those who wish to cause a clash between Muslims and Christians commit another inside job? According to LinkedIn, Abdelmageed has worked at the Regional Center since June 2015. Abdelmageed’s account mirrors two others interviewed after the shooting, including Juan Hernandez. They all state that the alleged shooters were dressed in military style fatigues. 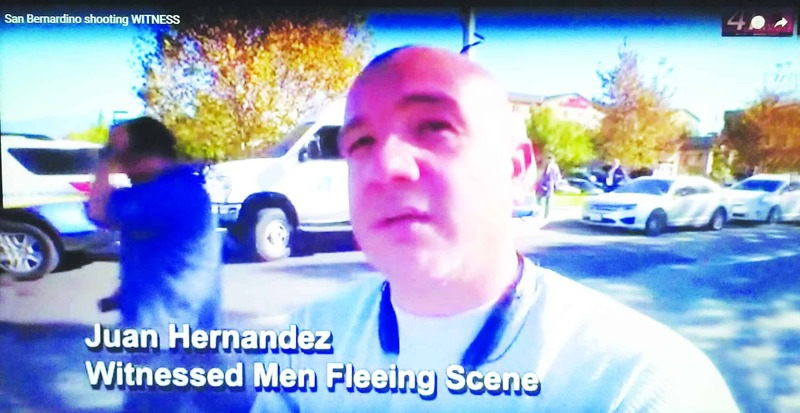 According to Hernandez the terrorists were in fact white males. “From where I was right here, we seen three white men in military fatigues taking off.” So what are the unexplained reasons that led police to this brown-skinned couple, one of whom was diminutive in stature, when immediate reports from eyewitnesses stated that the shooters were three men that appeared to be white, tall, and athletic? Even law enforcement announced that they were looking for three perpetrators. In an interview with CNN’s Chris Cuomo, attorneys representing the family members of Syed Rizwan Farook, who is accused along with his wife Tashfeen Malik, of fatally gunning down 14 victims while injuring 21 others, pointed out glaring inconsistencies. “There are a lot of things that quite frankly do not add up and are implausible,” said David S. Chesley. “From what I understand is that the couple was found handcuffed lying face down in this truck shot up.” Both Farook and Malik were fatally gunned down by police in an alleged ‘shootout’ within hours after the attack. Chelsey and Mohammed Abuershaid raised questions regarding the couple’s lack of military training, Malik’s physical limitations, the lack of suspicious activity on social media, and their dearth of ties or affiliation to extremists. The attorneys emphatically stated that the circumstances just don’t make sense. According to Chelsey, they had concluded a 3-hour meeting earlier in the day with the FBI who tried to identify some characteristics or affiliations that Farook may have had that could explain his alleged killing spree. Even FBI agents were totally stumped and frustrated. Additional information released continues to lead to more questions rather than answers. How is it that Malik posted her allegiance to ISIS on a Facebook account at the very moment the attack was taking place? Why were active shooter drills scheduled once a month at the Inland Regional Center? What is the explanation for the sudden end to the search for the 3rd suspect? In addition, it was quite shocking that the apartment shared by the couple, considered a “crime scene” by law enforcement, even if considered of minimal importance would be left unsecured. Without a doubt the crime scene involving alleged terrorist should have been secured for weeks. After a mere 48 hours following the attack journalists from multiple media outlets were let into the deceased couple’s apartment contaminating the scene. Also, it was obvious to viewers that the FBI had not removed photographs, paperwork and identification documents from the apartment. 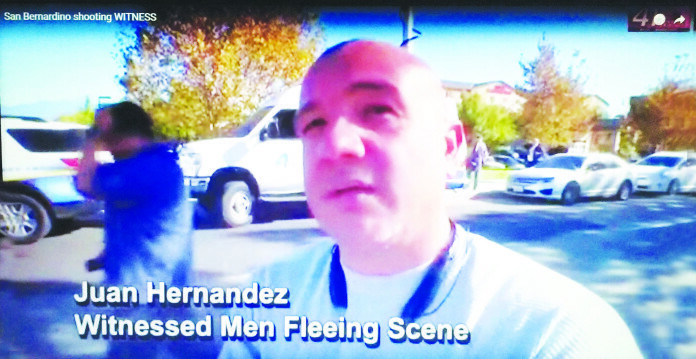 As details from the San Bernardino tragedy continue to emerge, many are left wondering what really took place the morning of Wednesday, December 2nd at the Inland Regional Center. Who stands to gain the most from the abrupt change in the direction and the anomalies in this unfolding story? While American justice promises the accused “due process of law” most can acknowledge that this concept is disproportionately applied. Good journalism and detective work demands a full and thorough investigation. This is an example that everything is not always as it may seem.